After the enormous success of their Tower 120 CPU Cooler, the masters of performance cooling have returned with a radical redesign that is made to impress with both it's style and performance. By increasing the air-contact area, this Extreme CPU Cooler is built to deliver unprecedented thermal performance. 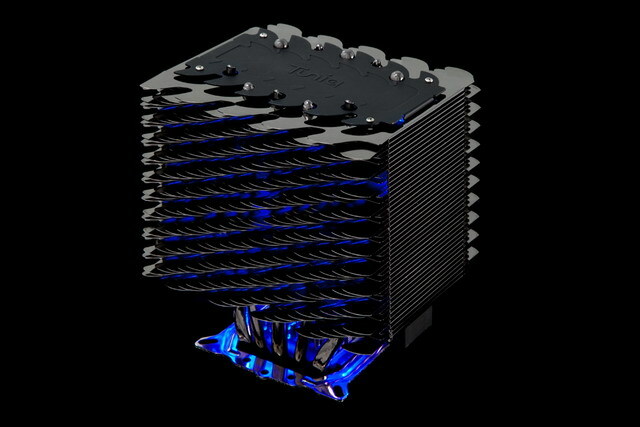 Thanks to it's unique wave-like fins, the Tuniq T-120 EXTREME LED CPU Cooler delivers an ultra-impressive visual appeal. Designed to make PC enthusiasts stand at attention, it's enclosed Blue LED is combined with it's dynamic nickel-plated surface for a jaw-dropping visual effect. To ensure that the maximum cooling performance, the Tuniq T-120 EXTREME LED CPU Cooler is packaged with the TX-3, one of Tuniq's highest performing thermal compound.